The PVGP Historic Races at the Pitt-Race Complex (previously known as BeaveRun) started in 2004 and has grown over the past decade into a vintage race event that stands alone. Pittsburgh International Race Complex is the ideal venue for racing the big thunderous Mustangs, Corvettes and Jaguars – cars that need a big track to test the mettle of these ground pounders. Also racing were open wheel competition with Formula Fords and Formula Juniors. The best of Europe was represented by BMW, Porsche, Jaguar, Lotus and Alfa Romeo. The Pittsburgh International Race Complex is a purpose-built track, 40 miles northwest of Pittsburgh. It has recently come under new ownership and has been renamed from BeaveRun. Plans are underway to add the South Track extension in late 2014, stretching the track from 1.6 miles to a full size 3.4 miles. Many other improvements have already been made. PIRC's North Track is ideally suited to high performance driver training, racing of all types, vehicle demonstrations and testing. The track is 1.5 miles in length and has 12 turns. With a layout that flows over hilly natural terrain, the course offers exciting elevation changes and several blind-entry turns that challenge the abilities of drivers and riders alike. At lunch each day spectators had an opportunity to experience a lap of the track in a real race car. Named in honor of Candy Stephani, longtime volunteer and wife of VRG Race Chairman Ralph Steinberg who passed away in 2011. 15 minutes after the historic and vintage racing was completed on Saturday, the Flashlight Drags began. The track's front straightaway was converted into a 1/8 mile drag race complete with a flashlight start and electronic scoring. The Flashlight Drags joined up with the PVGP in 2011 and has raised a lot of smoke and over $2,500! There was a 1-on-1 Autocross training with expert autocross instructors. This was an open event hosted by the Steel City Region of the SCCA. No points were awarded and no experience needed. Friday was a practice event. Saturday and Sunday was the Autocross / Solo School. Every year the Pittsburgh Vintage Grand Prix selects a car to be honored as the Marque of the Year (pronounced Mark). 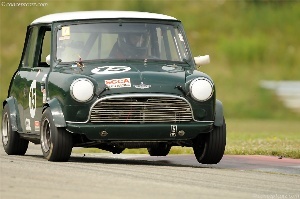 The Marque of the 2014 Pittsburgh Vintage Grand Prix is Mini. The last time Mini was marque was back in 2003.